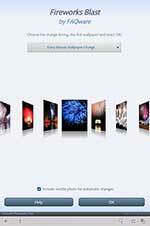 Over 45 fabulous fireworks wallpapers with sound effects too, now in the Nook Marketplace! 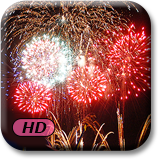 Fabulous fireworks wallpapers with sound effects too! Admire over 45 beautifully captured pictures of fireworks display from around the World. Celebrate every occasion from holidays to birthdays with these spectacular, colorful pyrotechnic images. 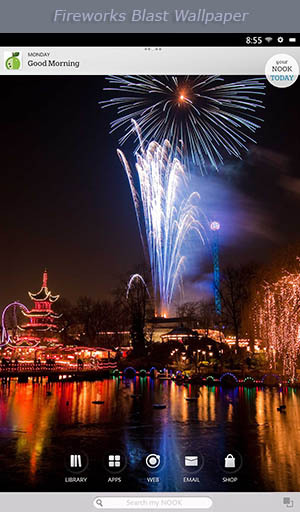 Swipe up or down on the home screen to hear fireworks and change photos to the next or previous photo any time you want. Set photos to change automatically each week, day, hour, minute or seconds. You'll have fun personalizing your Color/Tablet/HD/HD+ home and lock screen with these high resolution wallpapers that look absolutely breathtaking on your device! And check out our other popular "A+" Wallpapers too, such as Twinkies Hostess Cupcake Wallpapers! Now tap the deviceworks Blast choice.